Loom is a new cross platform 2D game engine and they are giving away copies of Loom for the next month – worth $500. Loom supports Windows, Mac, Android, ios and soon Linux. A simple command line password generator written in Python and supports both Python 2.7 and Python 3+. If ran with no arguments, it creates a 16 character password and copies it to the clipboard. 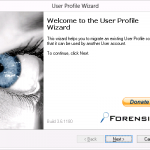 Rather than moving or copying user files around which can take some time on older PCs, I’ve started using a free tool called User Profile Wizard made by ForensiT.